Gartner published their magic quadrant again for x86 Server Virtualization Infrastructure. 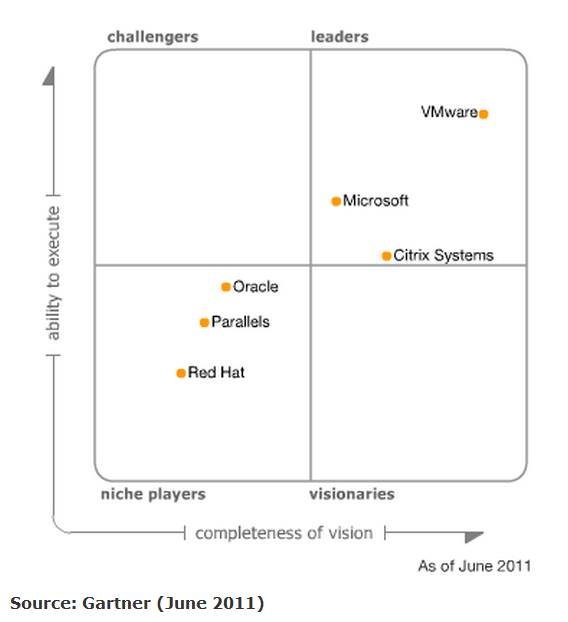 VMware again came out as the number 1 company in infrastructure virtualization. The number of installed server VMs and containers has nearly doubled in the past year as competition improves, virtualization adoption expands, the midmarket heats up, desktop virtualization drives more workloads to servers and workloads are deployed by cloud computing providers. The magic quadrant by Gartner shows VMware being the number 1 company in x86 Infrastructure Virtualization, followed by Microsoft and Citrix . As of mid-2011, at least 40% of x86 architecture workloads have been virtualized on servers; furthermore, the installed base is expected to grow five-fold from 2010 through 2015 (as both the number of workloads in the marketplace grow and as penetration grows to more than 75%). A rapidly growing number of midmarket enterprises are virtualizing for the first time, and have several strong alternatives from which to choose. Virtual machine (VM) and operating system (OS) software container technologies are being used as the foundational elements for infrastructure-as-a-service (IaaS) cloud computing offerings and for private cloud deployments. x86 server virtualization infrastructure is not a commodity market. While migration from one technology to another is certainly possible, the earlier that choice is made, the better, in terms of cost, skills and processes. Although virtualization can offer an immediate and tactical return on investment (ROI), virtualization is an extremely strategic foundation for infrastructure modernization, improving the speed and quality of IT services, and migrating to hybrid and public cloud computing. For the entire article go to the Gartner post over here.